Working with reading standard 9 is a challenge for elementary school students. The goal of this standard is to learn how to gather information from more than one source to learn more about a topic. As with all good instruction, this requires think-aloud modeling and multiple modeling sessions. As I worked with a group of third graders this month, I helped did a whole class modeling session that can be adapted for any topic. It might be useful to use this same process when modeling the thinking involved with this standard with your students. 1 Before beginning this model lesson, select two short passages or excerpts about the same topic. I like to use passages that can be read aloud together and average about a page in length. This can be challenging, so reading an excerpt is a great alternative. 3 Share one text at a time. As you read, stop and discuss with students. Be certain to think out loud about your wonderings, predictions, or areas of confusion. When you finish reading the first text, create a T-chart and write the name of the text at the top. 6. Collaboratively discuss the differences between each text, noting characteristics of each. Sound confusing? It isn’t! 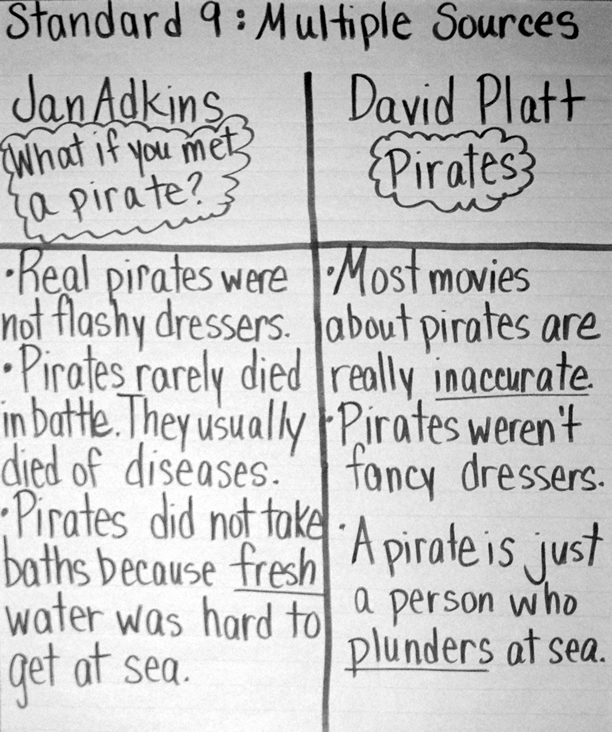 Here is my chart that I made with students using Jan Adkins, What if you met a pirate? and David Platt’s Pirates. Students were excited to look for differences between the information in the two texts. We plan to do this as a whole group with another 2-3 paired texts. After that, we want students to work in small groups to complete a few, moving to independence next month. Do you have a fun, effective way to model reading standard 9? Share your stories here! This is extremely helpful. Thanks! !